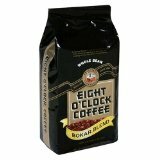 This is a hard to find blend of Eight O’Clock coffee that tastes very close to a Kona blend of coffee. Semi-dry and sharp crisp tasting coffee. This is the Bokar Blend in the whole bean format, which is the best way to buy coffee as you can grind the beans just before you are ready to brew. Look for Eight O’Clock coffee in the black bag, (Columbian also comes in a dark bag). This is one of our top recommendations for whole bean coffee. Also, this brand is a lot cheaper than all the blends of Starbucks beans you can buy. Have no idea why this coffee is so hard to find as it is such a good blend of coffee. Worth paying extra for, if you can even find it to buy.